I just got back from an incredible weekend at Food Blog Forum conference in Orlando, and I'm so giddy to finally share with you some of the many things I learned. 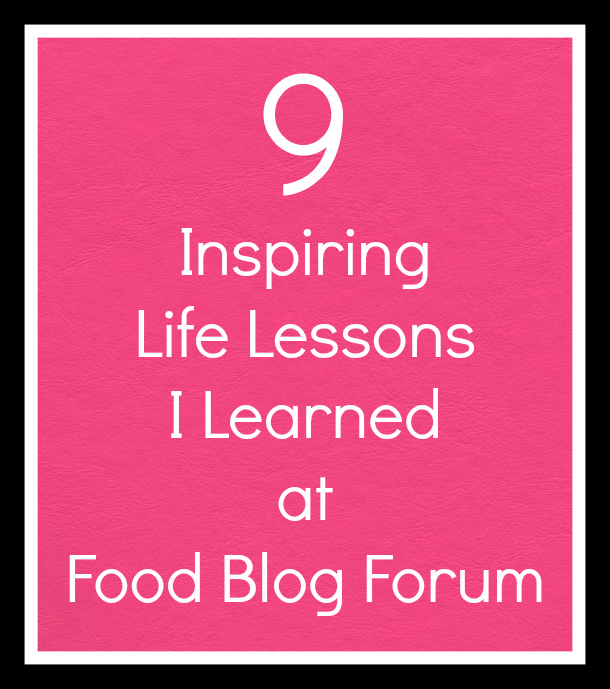 As you might know, there are a LOT of conferences for food bloggers, but what I love most about FBF is that the focus is all about helping us grow personally and professionally as bloggers and creatives. The weekend lessons go far beyond the pages of our blogs, and are actually applicable to all other aspects of our lives. I was loving it so much that I filled an entire notebook with notes and quotes and observations. It was pretty major. Here are 9 of my favorite lessons from the weekend, and don't worry if you're not a blogger because these aren't blogging lessons. These are LIFE lessons! 1. 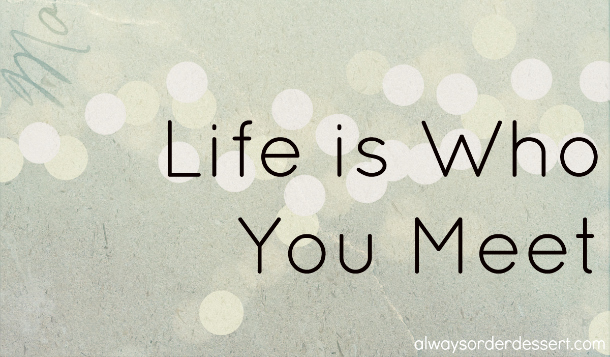 Life is who you meet. Every single person you meet or interact with has the potential to add value to your life and help you move toward your goals. From the random person sitting next to you on the plane, to the folks you chat with on Twitter, you never know who your next champion will be. As Julie from The Little Kitchen mentioned in the panel on building a grassroots community, everyone has the potential to be an ambassador for you. Sometimes when we're exhausted, in a rush, or just feeling shy, it may feel easier to ignore people or be curt with the idea in mind that "Oh I'll never see him again," but the truth is that you never know what person or conversation can lead to your next big opportunity. Put yourself out there. Go to random events you'd kinda rather skip. Talk to people. Give out business cards. Tell total strangers about your blog, your projects, your dreams. Treat all people genuinely and with kindness, and you'll be amazed at the doors that open up for you. 2. 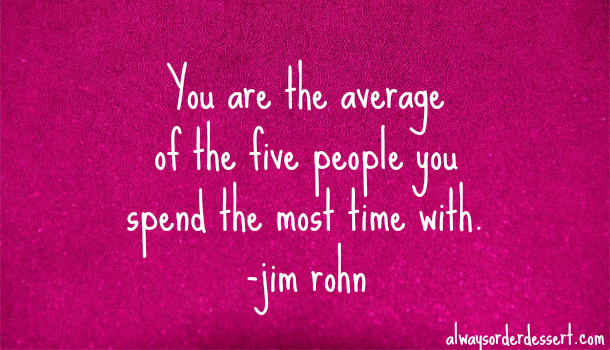 You are the average of the five people you spend the most time with. This is a point that Jaden and Scott brought up during their session on redefining success, and it's so very true. The personalities and aspirations of the people we spend the most time with affect our own moods and aspirations. Think about the people you talk to all day at work or in your social circle--are they the ambitious cheerleader types? Or the gossipy negative ones? Do you feel energized and inspired when you spend time with them? Or do they make you feel stuck and grumpy? Pay attention to this, and make changes if you need to. Surround yourself with people who are doing the things you want to do, and let them inspire and push you toward achieving your own goals. If you work in an environment where the people tend to get you down, seek out other places where you can connect and share with some more upbeat folks. This might just mean asking to move to a different desk (blame the AC vents or the glare from the window). Or it could mean joining a club, making an effort to hang out with some of your best girlfriends more often, or even signing up for a class on a subject that fires you up. Whatever you have to do, do it. Take charge of your situation and make a change for the good. 3. 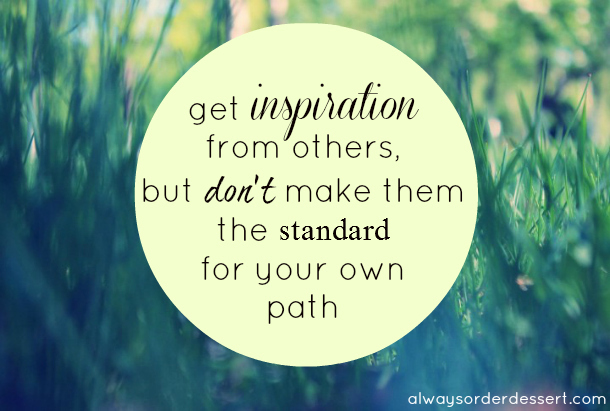 Get inspiration from others, but don't make them the standard for your own path. You've heard the saying "comparison is the thief of joy." This is especially true on the web, which can be an incredibly envy-inducing place to hang out. From the fashion bloggers in their perfectly styled outfit photos to the immaculate houses in the design blogs and all those amazing projects all over Pinterest, it's easy to compare all that perfection to your own life and end up feeling a little... frumpy, messy and inadequate. But that doesn't mean that you should just shut down the computer and hide under your bed to preserve your sanity--that won't change anything and it certainly won't get you any closer to creating the life you want to live. Instead, look to others for inspiration! Let them teach you, push you, and drive you to grow, all while keeping sight of the fact that we each have our own path. There is no single right way or right timeline, so take the bits that resonate with you and use them as the kick you need to create your own kind of perfection. 4. 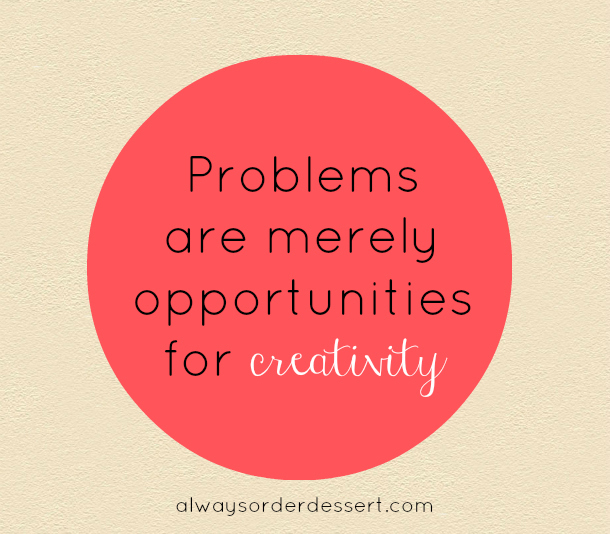 Problems are merely opportunities for creativity. My FAVORITE speaker at the conference was Tim Warzecha, who is a Disney Imagineer. Imagineers are the men and women who conceive, design, and implement ALL of the amazing attractions and elements at Disney. They basically dream up amazing things for a living, and then make them a reality. In his talk, Tim described the Imagineer process for creating a project, from conception to completion. While describing the process, I noticed that the language he used was very deliberate, and that one word kept popping up: "opportunity." I asked him about this, and he explained that for Imagineers, there is no such thing as "problems." There are simply opportunities for creativity. Whenever they come up against a difficulty or issue, they ask themselves "What are the opportunities here?" and use it as a way to further reinforce their storytelling. He noted that once they adopt that mindset, it becomes easy--and even fun!--to find solutions to challenges. As an example, he explained how the sprawling design of an African-themed restaurant necessitated huge weight-bearing columns throughout the dining room that would have taken away from the aesthetics of the environment. They chose to look at this as an opportunity, and instead turned the columns into large trees that ended up adding more to the design and the story they were trying to tell. I loved this concept, and saw that it was instantly applicable to both my blog and my life. It's a given that we will have problems, but by looking at them as an opportunity to stretch your creativity and your resources, you will be able to come ahead stronger, wiser, and infinitely more incredible than you would have without the struggle. 5. 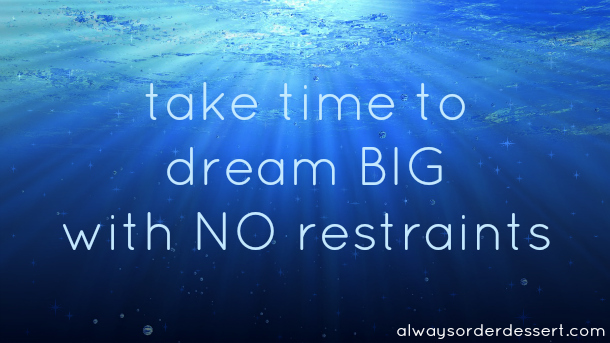 Take time to dream BIG with no restraints. I was also fascinated by Tim's description of Disney's Blue Sky Studios, the department within the Imagineering group that dedicates itself to brainstorming. They have a big room filled with toys and craft supplies, and each day, the folks who work there have just one job: to dream up ideas with no restraints or limitations. Those ideas are then whittled down and refined and developed until they become actual rides or parks or attractions, but they all begin the same way--as wild ideas. I think we all need to establish a little Blue Sky Studio in our own life. Whether it's just a couple hours or a even a whole weekend a month of just crazy all-out no-limits dreaming and playing, we need to get in the habit of thinking BIG for ourselves. What would you do if you could do anything? What would you want to achieve? Where would you go? What would you make? Set yourself free to go as far as your imagination can take you. You might be surprised by just how achievable those dreams can be, once you dare to dream them. 6. 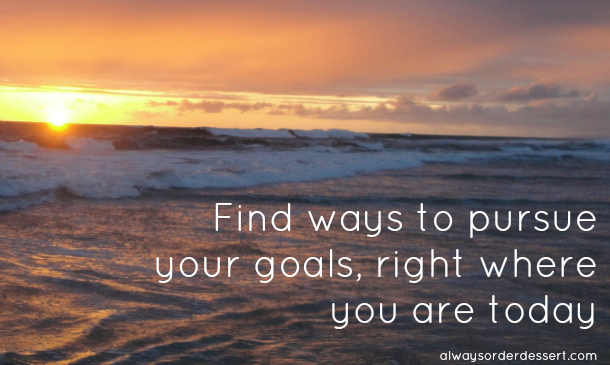 Find ways to pursue your goals, right where you are today. I started my blog a little over 5 years ago, because as much as I enjoyed the job I had as a magazine editor, my real passion was writing about food. While not 100% the dream that I had (which was to spend all day cooking, writing, and talking about food), starting a blog was a beginning, and it was a way of giving me at least a few hours a day of living my dream. Knowing that I had this place where I could go to every single day to do what I love, instantly made my life better without requiring any drastic changes. Jaden talked about how we ALL need something like this in our life. Whether it's on the weekends or a couple hours in the evenings after work, find a way to capture a little bit of that big dream you have, right where you are today. One great idea that Jaden shared was negotiating for time. If you're offered a raise at work (or told there is no budget for one), try to see if you can instead trade that for a couple additional days off a month, or the flexibility to work from home so that you can travel or save those commuting hours. It may not be everything, but it's a little way of capturing more time for yourself to spend on the things that you love. For me, one of my (many!) current dreams is to work in television regularly as a host on a food and lifestyle program, and while I don't yet have my own show or even a regular correspondent gig, I have been creating more and more opportunities for myself so that now I am on TV 2-3 (or even more) times a month. It gives me a few hours a month of doing the thing that I love and want for myself, and I know that just like with my blog, it will continue to grow until it's no longer a dream, but my reality. 7. 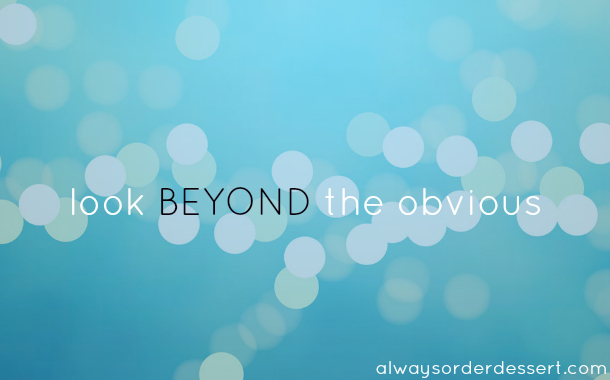 Look beyond the obvious. Todd and Diane Cu, the brilliant bloggers and photographers behind White on Rice Couple, gave a beautiful presentation about photography and videography. One of their best tips was to always look beyond the obvious. As an example, they talked about how they wanted to share their garden with their readers, but didn't want to do it the obvious way of just posting photos or a simple video tour. Instead, they decided to create a video following their dog around as she played in the garden chasing after bubbles. The result was gorgeous, entertaining, and totally unexpected. I have zero interest in gardens and gardening, but I could watch that video 5 times straight. As bloggers and creatives we can sometimes get stuck in a rut; this was a great reminder that to shake things up, we sometimes just need to look at things from a different perspective. 8. 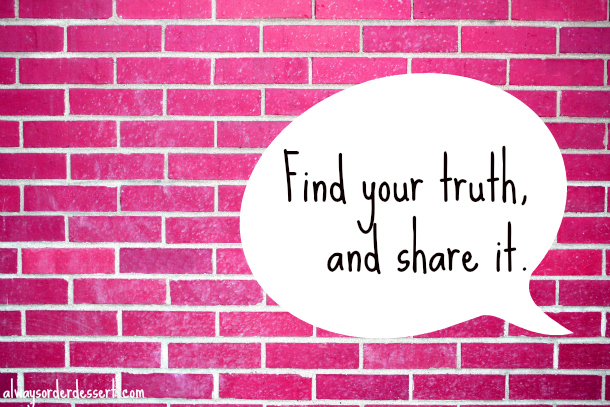 Find your truth, and share it. Do you ever have moments when you think to yourself "Am I the only one who [fill in the blank]"? Here's the thing, the answer to whatever you're thinking is pretty much always "no." Because you are NOT the only one. There are dozens and hundreds and maybe even thousands of us who feel that way, too, and would love to hear someone else say it first. When bloggers and creatives come together, there is always a lot of talk about "authenticity." You have to be authentic, people say again and again. And it's true, but what does that really mean? What is authenticity? To me, it's just that. It's sharing your truth. It's sharing your story. And your truth and your story are a collection of all those little moments. In the panel on building community, Lindsay from Love & Olive Oil wisely noted that "the more specific you are, the more people you will reach." This doesn't mean that you have to divulge all your most private secrets. It simply means that you should understand the things that make you, you, and make them a part of what you're sharing. What makes you tick? What fires you up? What makes you laugh? People relate to passion. They relate to honesty. And all those specific little moments and quirks that make you feel totally alone, are actually the things that will speak to people the most. 9. 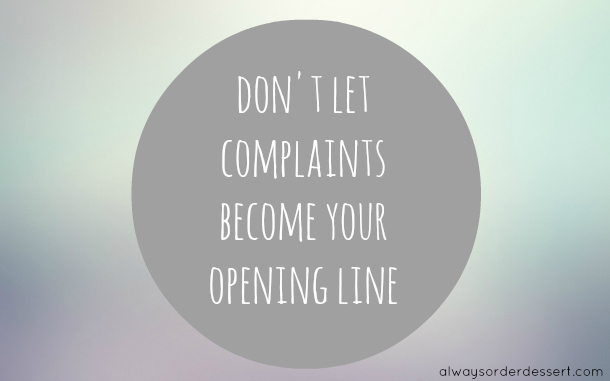 Don't let complaints become your opening line. During one of the break sessions, I approached a sponsor representative that I was eager to meet as I'd like to potentially work with her company. I walked over to her, fired up after the inspiring session that had just finished and excited to make the connection. But as soon as she opened her mouth, it was like getting dumped with a bucket of ice water. She was rolling her eyes and complaining about the session, which she personally didn't like. I had walked up to her feeling inspired and excited, but her negative energy instantly turned me off. I'm sure she was actually a nice lady, but I couldn't handle the negativity--so much so that I found a way to politely cut her off and all but ran in the opposite direction. This was especially bad because she was there representing a company, but even if she had been just another blogger, it would have been disappointing. Because here is the thing. There are always going to be things that we don't like. Boring speakers. Stinky bathrooms. Too much air conditioning. If you're looking for something to complain about, you'll find it. And this might be fine if it's just you and your best friend or husband commiserating, but if you're in a room full of new people (and potential networking contacts) don't let the complaints become your opening line. Don't let negativity be your first impression, because that is not going to make people want to get to know you. I'd love to know if any of these lessons in particular resonate with you. I for one, am going to start off by making #5 a regular part of my day!